Some EOS Rebel T4i digital SLR cameras produced from May 31 through June 15, 2012 may be affected. You can use the serial number to check whether your camera is affected by this phenomenon. If the sixth digit of the serial number is "1" please follow the procedure below. 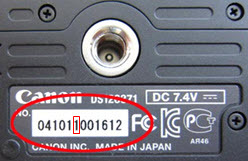 If the sixth digit of the serial number is "2" or higher, your camera is not affected. The amount of zinc bis (N,N'-dimethyldithiocarbamate) detected during our testing was minimal. While Canon has not received any reports of injury or allergic reactions, depending on one’s health and physical condition, in rare cases when this substance comes into contact with skin, allergic skin reactions* may develop. In addition, if eyes are rubbed after contact with the substance, symptoms, such as red eyes, may develop. health and physical conditions, and sensitivity of one’s skin structure, and not everyone will be affected by allergic symptoms.